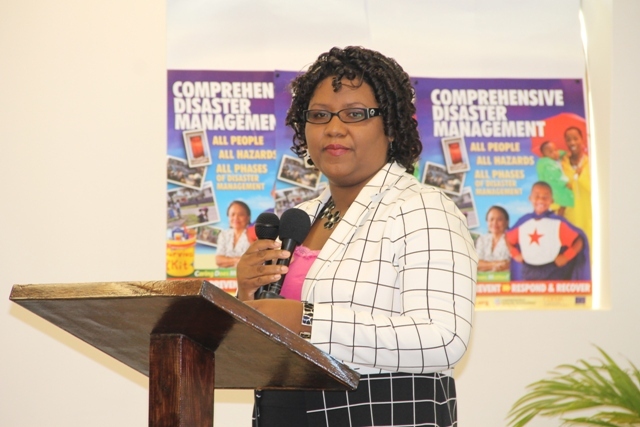 Chairperson and Coordinator of Youth in the Department of Youth and Sports Zahnela Claxton delivering opening remarks at the UNESCO Youth for Human Rights Awareness Training for Trainers Workshop on March 4, 2015 at the Disaster Management Department’s Emergency Operation Center Conference Room. 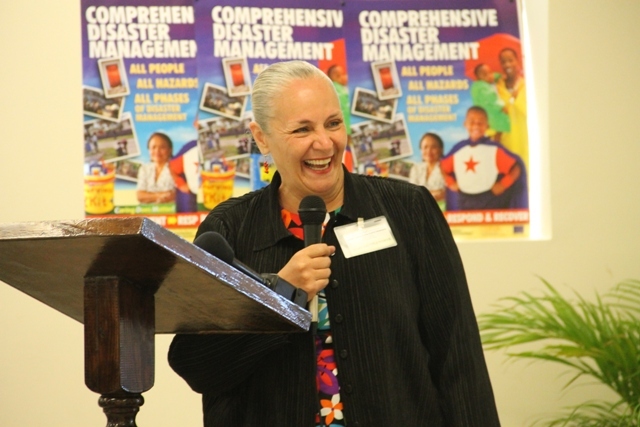 NIA CHARLESTOWN NEVIS (March 10, 2015) –The Department of Youth and Sports continues its efforts to empower the youths as they collaborated with SKN National Commission for UNESCO to host UNESCO Youth for Human Rights Awareness Training for Trainers Workshop on March 4,2015 at the Disaster Management Department’s Emergency Operation Center Conference Room. Chairperson and Coordinator of Youth in the Department of Youth and Sports Zahnela Claxton in her opening remarks said, the objectives of this workshop were to define human rights, facilitate the implementation of Human Rights Education in all institutions, demonstrate how Youth for Human Rights International Training Materials are to be used in the training of groups, promote just for those who rights may be violated and promote the understanding that with rights there are responsibilities. Secretary General for the SKN Commission for UNESCO Antonio Maynard stated that the need to add human rights to school’s curriculum was critically important. He also stated that there was hope that this workshop would produce a Youth for Human Rights Organization on the island. 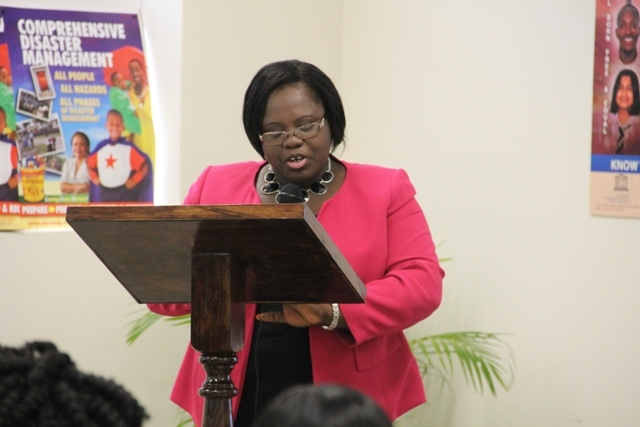 “It is imperative that St. Kitts and Nevis and the Ministry of Education in particular, make the subject of human rights an active subject matter amongst the youths in the federation and throughout the education system…There are two very important objectives that we expect to come out of this workshop and this particular project. 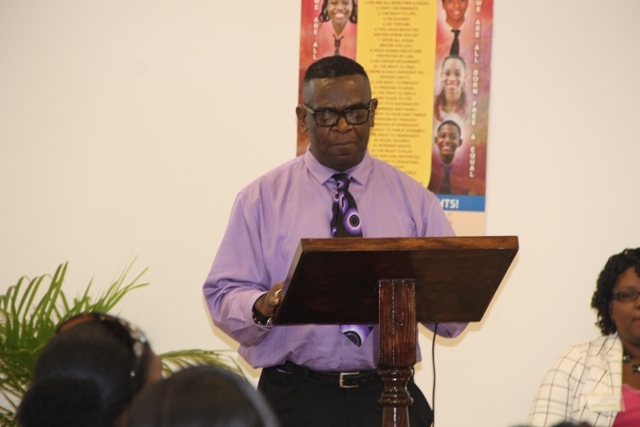 That is the implementation of Human Rights education should be integrated within the school’s curriculum…we are hoping that a Youth for Human Rights Organization can be established on Nevis,” he said. Minister of Social Development Hon. Hazel Brandy – Williams expressed in her remarks, her appreciation for both the project and participants. She also stated that she supported the defense of the rights of civilians. “I take this opportunity to congratulate the participants for taking the 1st step in the Youth for Human Rights Awareness Campaign… I appreciate and embrace every attempt to bring awareness about our human rights. We advocate for all the rights of our people and often the agents of change defending the rights of our citizens and so I am hoping that you are here for the sole purpose of assisting to help persons in defending their human rights,” she said. President of the Youth for Human Right International Dr. Mary Shuttleworth shared an experience that lead her to become an activist for human rights. Shuttleworth also stated that Nevis is the 85th country she has visited on her world tour.